Home Technology audio Are rich media better than single media in online learning? Are rich media better than single media in online learning? First of all, a happy New Year to everyone from almost the last place on earth to come into 2015. This is a discussion of the last characteristic or dimension of media and technology that influence teaching and learning for my open textbook, Teaching in a Digital Age. It is also an important characteristic, more easy to define than the previous one (interactivity). In Section 8.2, ‘A short history of educational technology’, the development of different media in education was outlined, beginning with oral teaching and learning, moving on to written or textual communication, then to video, and finally computing. Each of these means of communication have usually been accompanied by an increase in the richness of the medium, in terms of how many senses and interpretative abilities are needed to process information. Another way of defining the richness of media is by the symbol systems employed to communicate through the medium. Thus textual material from an early stage incorporated graphics and drawings as well as words. Television or video incorporates audio as well as still and moving images. Computing now can incorporate text, audio, video, animations, simulations, computing, and networking, all through the Internet. Once again then there is a continuum in terms of media richness, as illustrated in Figure 8. above. Also once again, design of a particular medium can influence where on the continuum it would be placed. For instance in Figure 8.1, different forms of teaching using video are represented in blue. 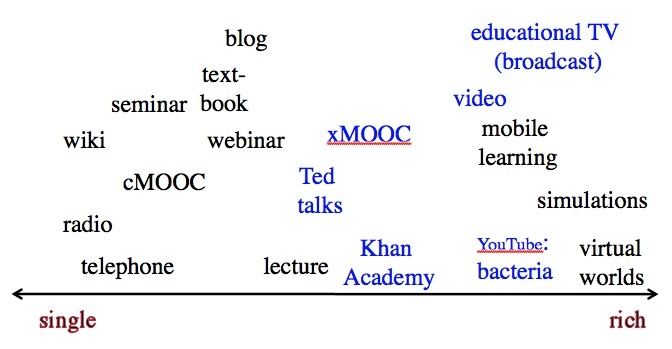 Ted Talks are usually mainly talking heads, a televised lecture, as are often xMOOCs (but not all). The Khan Academy uses dynamic graphics as well as voice over commentary, and Armando Hasudungan’s You Tube video on the structure of bacteria uses hand drawings as well as voice over commentary. Educational TV broadcasts are likely to use an even wider range of video techniques. However, although the richness of video can be increased or decreased by the way it is used, video is always going to be richer in media terms than radio or textbooks. Radio is never going to be a rich medium in terms of its symbols systems, and even talking head video is richer symbolically than radio. Again, there is no normative or evaluative judgment here. Radio can be ‘rich’ in the sense of fully exploiting the characteristics or symbol systems of the medium. A well produced radio program is more likely to be educationally effective than a badly produced video. But in terms of representation of knowledge, the possibilities of radio in terms of media richness will always be less than the possibilities of video. But how rich should media be for teaching and learning? From a teaching perspective, rich media have advantages over a single medium of communication, because rich media enable the teacher to do more. For example, many activities that previously required learners to be present at a particular time and place to observe processes or procedures such as demonstrating mathematical reasoning, experiments, medical procedures, or stripping a carburetor, can now be recorded and made available to learners to view at any time. Sometimes, phenomena that are too expensive or too difficult to show in a classroom can be shown through animation, simulations, video recordings or virtual reality. Furthermore, each learner can get the same view as all the other learners, and can view the process many times until they have mastery. Good preparation before recording can ensure that the processes are demonstrated correctly and clearly. The combination of voice over video enables learning through multiple senses. Even simple combinations, such as the use of audio over a sequence of still frames in a text, have been found more effective than learning through a single medium of communication (see for instance, Durbridge, 1984). The Khan Academy videos have exploited very effectively the power of audio combined with dynamic graphics. Computing adds another element of richness, in the ability to network learners or to respond to learner input. From a learner’s perspective, though, some caution is needed with rich media. Two particularly important concepts are cognitive overload and Vygotsky’s Zone of Proximal Development. Cognitive overload results when students are presented with too much information at too complex a level or too quickly for them to properly absorb it (Sweller, 1988). Vygotsky’s Zone of Proximal Development or ZPD is the difference between what a learner can do without help and what can be done with help. Rich media may contain a great deal of information compressed into a very short time period and its value will depend to a large extent on the learner’s level of preparation for interpreting it. For instance, a documentary video may be valuable for demonstrating the complexity of human behaviour or complex industrial systems, but learners may need either preparation in terms of what to look for, or to identify concepts or principles that may be illustrated within the documentary. On the other hand, interpretation of rich media is a skill that can be explicitly taught through demonstration and examples (Bates and Gallagher, 1977). Although YouTube videos are limited in length to around eight minutes mainly for technical reasons, they are also more easily absorbed than a continuous video of 50 minutes. Thus again design is important for helping learners to make full educational use of rich media. the rich medium may be inappropriate for the learning task. For instance, if students are to follow and critique a particular argument or chain of reasoning, text may work better than a video of a lecturer talking about the chain of reasoning. In general, it is usually a useful guideline always to look for the simplest medium first then only opt for a more complex or richer medium if the simple medium can’t deliver the learning goals as adequately. However, consideration needs to be given to media richness as a criterion when making choices about media or technology. This is the last of the characteristics of media and technology that can influence decisions about teaching and learning. The next section will provide an overview and summary. 1. Do you agree that: ‘it is a useful guideline always to look for the simplest medium first‘. 2. How important do you think the richness of medium is when making decisions about the use of media and technology? 3. Do you agree with the placement of different media on this continuum. If not, why not? 4. Any other comments on media richness? The next section will try to pull together the chapter on Understanding Technology in Education into some sort of overview or conclusion, with a special emphasis on how to use these characteristics of media in decision-making. The next chapter will be on the pedagogical affordances of different media, which will be more concrete and less theoretical than the current chapter. I had a lot of experience creating interactive simulations. These afford a huge space for learners to explore, but tend to be time-consuming / costly to produce. What I want to say is that if the software does all the computation and animation, there is nothing much left to the imagination. Like Einstein said, “Imagination is more important than knowledge.” So maybe it is a good idea to get the students to use their imagination and make up their own animations (which may even be “low tech” paper cut-outs animated by hand). By doing so, we help students to develop IDENTITIES of active prosumers, creative communicators, instead of just passive consumers. For more on the topic of identities, check out my new blog. A great point, and I totally support your thinking here. I will be discussing simulations later under pedagogical affordances of different media, and will be sure to take your comment into account. Many thanks. I think it is important to look at the learner and the learning objectives first. The medium is only the means of serving the learner in reaching the learning objective. I think the points raised here (such as density of information contained in rich media) are good. They probbably require more depth. Perhaps additional case studies would help. Generally, I agree with the scale you have developed. But I think it is also worth considering that another scale might be useful, such as relative densities of information. For example, I am thinking of some Ted Talks, which are very much radio with pictures in terms of density (and I do not mean this to be insulting at all)..
Additionally, some diagrams, charts, etc. are more or less dense. It does not make sense to place categorize them in the same way. Many thanks, Gerald. You make excellent points and I need to think about how best to accommodate them in the text. Much appreciated. I see no easy heuristics here. We should be aiming for the situation where learners can readily handle the richest media that we are capable of developing well because this is a closer approximation of the “real world.” It is in the real world with all of its richness and contradiction that we must continue to learn long after assistance is un-available or un-useful to us. Many thanks for this, Frank – excellent questions for an instructor to ask of themselves.